There are many options to correct refractive vision errors and restore clear, sharp vision. While LASIK is the most popular treatment offered at Foulkes Vision, there are certain people who aren't ideal candidates for this procedure. If Dr. Foulkes determines that LASIK isn't right for you, then you may want to consider an alternative such as Visian ICL. Visian ICL is a vision correction treatment that involves inserting an implantable collamer lens into your eye to correct myopia (nearsightedness). The implantable collamer lens functions similarly to traditional contact lenses. However, instead of taking them out every night for cleaning, the Visian ICL gets permanently placed inside of your eye. This provides the long-term vision correction results you desire while eliminating the hassles associated with removing and cleaning contact lenses every day. The best way to determine whether Visian ICL is the right vision correction option for you is to speak with Dr. Foulkes. During your initial evaluation, he will recommend the ideal treatment plan based on the health and condition of your eyes. Please call 630-724-1400 today to schedule your free consultation. Am I a Visian ICL Candidate? Dr. Foulkes will surgically insert the Visian ICL into your eye, placing it between your eye's natural lens and your iris. Once inserted in your eye, the implantable collamer lens will bend light so that it focuses properly on your retina. This is essentially the same function performed by eyeglasses or traditional contact lenses. Your procedure will be similar to a cataract surgery procedure, which replaces your eye's natural lens with an artificial intraocular lens. However, because Visian ICL consists of a "phakic" lens, your natural lens does not need to be removed as part of this procedure. Visian ICL surgery can be completed in approximately 15 minutes. You won't be able to feel the lens implant in your eye, and it won't be noticeable to others. Most importantly, you won't require any special daily maintenance since the lens is permanently implanted in your eye. Vision improvement should occur almost immediately, and you will typically be able to resume all normal activities the following day. Improved distance vision: According to clinical studies, approximately 95% of Visian ICL patients experience 20/40 vision or better following surgery. Effective LASIK alternative: If you aren't able to undergo LASIK due to issues such as dry eyes or insufficient corneal thickness, Visian ICL provides a great alternative that will provide comparable vision correction results. Wide treatment range: Visian ICL is effective at treating myopia (nearsightedness) in patients with a prescription ranging from -3.00 diopters to -20.00 diopters. This is the widest treatment range of any refractive surgery procedure. 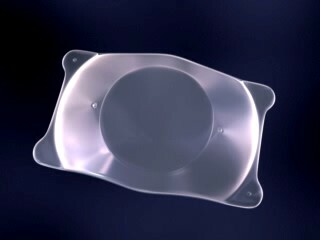 Short healing time: Because the lens implant is foldable, a very short incision can be used when placing it in your eye. The use of such a small incision reduces your recovery time. UV protection: The collagen material used in the Visian ICL provides some protection from the sun's harmful UV rays. However, this protection doesn't eliminate the need to wear sunglasses in order to receive the maximum possible protection from UV damage. Please contact Foulkes Vision using the form on this page or call 630-724-1400 today to schedule your free consultation. We serve patients in Chicago, Lombard, Downers Grove and the surrounding areas of Illinois.